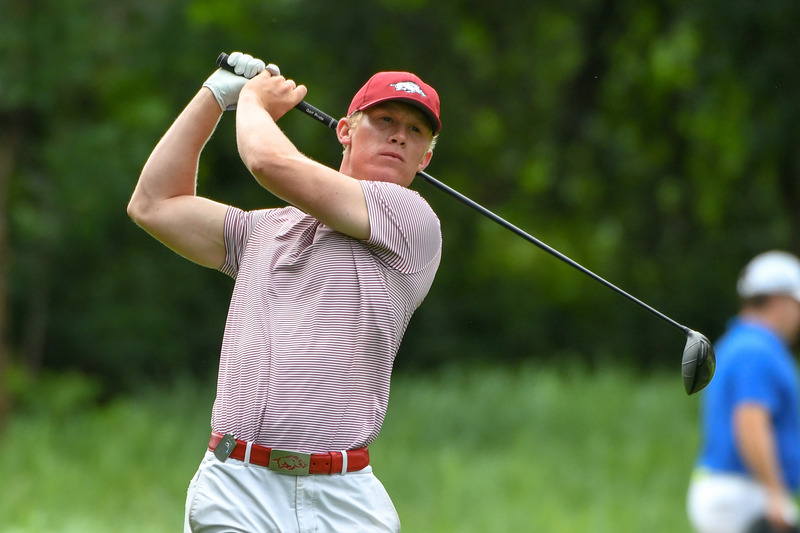 PALM CITY, Fla. – Due to the threat of inclement weather Tuesday, the Valspar Collegiate played the final two rounds Monday and the 35th-ranked Arkansas Razorbacks placed 14th with a 54-hole score of 869 (291-288-290) at The Floridian (par 71, 6,921-yards). However, two teams – #2 Duke and #20 USF – did not finish their third and final round Monday each having four holes left. The two squads will return to the course early Tuesday to complete their 54 holes. However, the team results should not be affected. Ninth-ranked Wake Forest won the 15-team event that featured 14 of the nation’s top 35 teams with a score of 827. Auburn, ranked 13th, was runner-up (833), followed by #31 South Carolina (836), top-ranked Oklahoma State (838) and #3 Vanderbilt (841). William Buhl turned in a career-best 16 birdies, the fourth-best total over three rounds. Tyson Reeder tied a career-high with 40 pars over 54 holes, which also tied for the tournament lead, while Wil Gibson carded 37 and Luis Garza had 36. Buhl climbed 12 spots in the final round to finish 33rd (tied), shooting a 2-under-par 69 with six birdies in the afternoon session. Buhl finished with a 54-hole total of 1-over-par 214 (71-74-69). He has seven rounds in the 60’s this season and 14 rounds or par or better this season. Reeder and Perico tied for 51st, each with a three-round score of 219 and each shooting a final-round 74. Perico posted rounds of 73-72 after 18 and 36 holes, respectively, while Reeder opened with rounds of 72-73. Luis Garza, playing as an individual, tied for 61st (75-71-75=221) and Mason Overstreet was one stroke behind Garza, tying for 63rd (80-69-73=222). The 2-under-par 69 in round two for Overstreet marked his fifth round in the 60’s this season and 21st for his three-year career. Wil Gibson rounded out the Razorback contingent, finishing 80th with a score of 230 (75-77-78). The Razorbacks will have one final tournament, the 3M Augusta Invitational April 6-7, before competing in the 2019 SEC Championship (April 24-28). Floridian National Golf Club • Palm City, Fla.